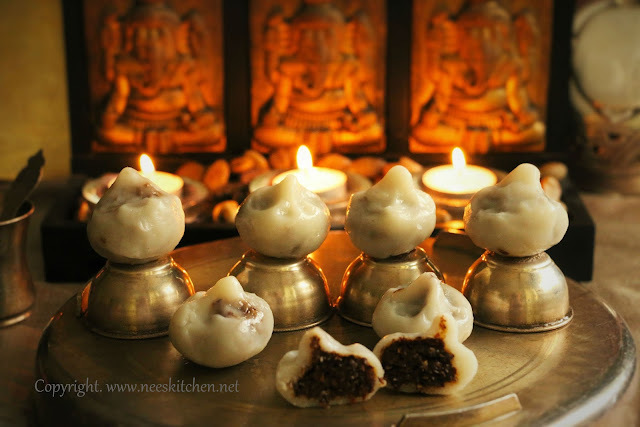 Today being Vinayaga Chaturthi I had plans to make the regular modak’s with coconut , sesame and urad dhal. However there was a big no no for the sesame modak from my kid as she does not like sesame. Hence I decided to replace it with flax seeds. In a way it was much faster than all other modak’s. 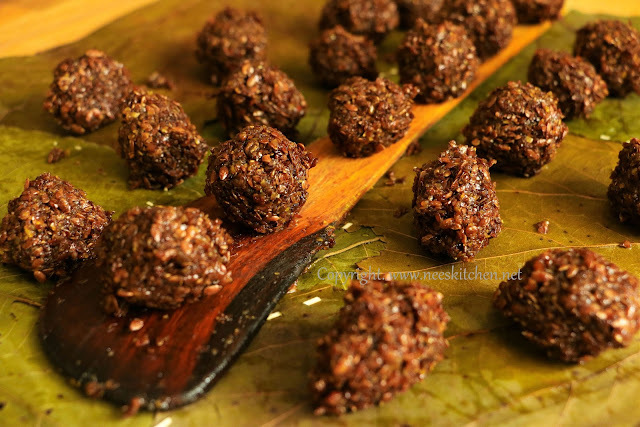 Flax seeds is ground along with palm sugar and cardamom powder as a powder and mixed with boiling water to form the modak stuffing. 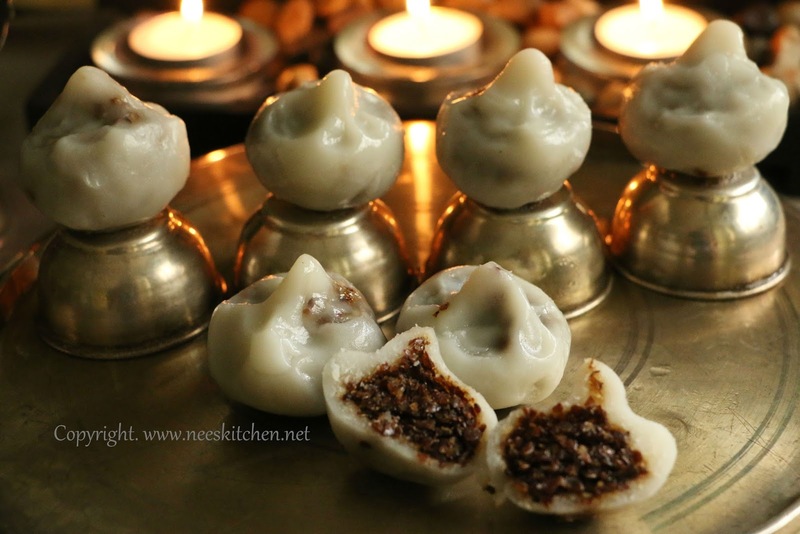 It this then stuffed with riceflour dough and steamed in dried biodegradable leaves (thonnai leaves) to get a quick and easy “Flax seed modak"
Flax seeds need not be cooked and can be used directly in the dishes. A part from being easy to cook, flax seeds are also healthy. They are high in omega 3 essential fatty acids which helps to reduce the risk of heart disease. I use palm sugar mainly due to its health benefits and also the powdered version does not require us to spend time in diluting in hot water and removing the impurities. 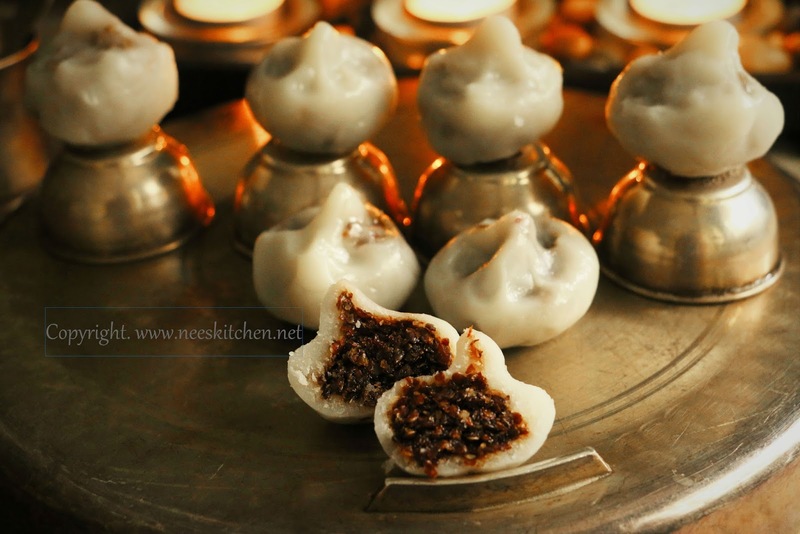 This would save some time and for beginners it is quite easy as they might at time skip the exact texture of jaggery water which is traditionally used for modak. To me, I didn’t find any difference between in the taste jaggery and palm sugar hence I am continuing this way. The taste is softer outside and crunchier inside as my flax seeds where not crushed completely. I wanted that way actually. It had more of a nutty flavor and was just loved by all at home. I did them in 2 batches with the first batch of only 1 cup rice flour to yield 14 and the second batch I combined with my other modak's. 1. Take a mixie and add the flax seeds, powdered palm sugar and elachi powder. 2. Blend 3 or 4 times and make it semi-powder. 3. Take a pan and add 1/3 cup water and allow it to boil. 4. Switch off the gas and add the flax seeds palm sugar mix. 6. Take them out and divide them into 14 equal balls. You need to rub your palm with ghee before shaping them so that they will not stick on to your hands. 7. Take 1 1/2 cup of rice powder, add salt and half a tsp of sesame oil. 8. Boil 2.5 cups of water, you may not need all of them. 9. Pour the water little by little on the rice flour and make it as a pliable dough. 10. Add sesame oil to this and cover with a wet cloth. Open it only when needed. 11. Rub your hands with ghee. 12. Take a small portion of rice flour and shape it into a round ball. 13. Later start making as a cup by starting to press from outer side. 14. Place the stuffing and cover it. 15. Take a pan for pressure cooker and place the dried thonnai leaves. 16. 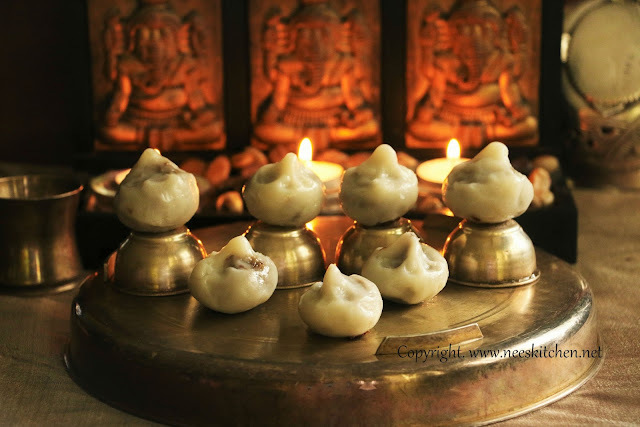 Place the modak’s and steam for 15 minutes. Flax seed modak is ready. The flax seeds might not become powder but it is still fine. It tastes well whether it in powdered or semi-powdered form.